Civilian GPS receiver in a marine application. The Global Positioning System (GPS) is currently the only fully functional Global Navigation Satellite System (GNSS). More than two dozen GPS satellites are in medium Earth orbit, transmitting signals allowing GPS receivers to determine the receiver's location, speed and direction. Developed by the United States Department of Defense, it is officially named NAVSTAR GPS (NAVigation Satellite Timing And Ranging Global Positioning System). The satellite constellation is managed by the United States Air Force 50th Space Wing. The cost of maintaining the system is approximately US$750 million per year, including the replacement of aging satellites, and research and development. Despite this fact, GPS is free for civilian use as a public good. A GPS receiver calculates its position by measuring the distance between itself and three or more GPS satellites. Measuring the time delay between transmission and reception of each GPS radio signal gives the distance to each satellite, since the signal travels at a known speed. The signals also carry information about the satellites' location. By determining the position of, and distance to, at least three satellites, the receiver can compute its position using trilateration, or the determination of a distance from three points. Receivers typically do not have perfectly accurate clocks and therefore track one or more additional satellites to correct the receiver's clock error. The current GPS consists of three major segments: the space segment (SS), a control segment (CS), and a user segment (US). The SS is composed of the orbiting GPS satellites, or Space Vehicles (SV) in GPS parlance. The GPS design calls for 24 SVs to be distributed equally among six circular orbital planes. The orbital planes are centered on the Earth, not rotating with respect to the distant stars. The six planes have approximately 55° inclination (tilt relative to Earth's equator) and are separated by 60° right ascension of the ascending node (angle along the equator from a reference point to the orbit's intersection). Orbiting at an altitude of approximately 20,200 kilometers (12,600 miles or 10,900 nautical miles), each SV makes two complete orbits each sidereal day (the length of time for Earth to make a full rotation with respect to a fixed star, namely, 23 hours, 56 minutes, and 4.1 seconds), so it passes over the same location on Earth once each day. The orbits are arranged so that at least six satellites are always within line of sight from almost anywhere on Earth. As of February 2007, there are 30 actively broadcasting satellites in the GPS constellation. The additional satellites improve the precision of GPS receiver calculations by providing redundant measurements. With the increased number of satellites, the constellation was changed to a nonuniform arrangement. Such an arrangement was shown to improve reliability and availability of the system, relative to a uniform system, when multiple satellites fail. The flight paths of the satellites are tracked by US Air Force monitoring stations in Hawaii, Kwajalein, Ascension Island, Diego Garcia, and Colorado Springs, Colorado, along with monitor stations operated by the National Geospatial-Intelligence Agency (NGA). The tracking information is sent to the Air Force Space Command's master control station at Schriever Air Force Base, Colorado Springs, Colorado, which is operated by the 2d Space Operations Squadron (2 SOPS) of the United States Air Force (USAF). 2 SOPS contacts each GPS satellite regularly with a navigational update (using the ground antennas at Ascension Island, Diego Garcia, Kwajalein, and Colorado Springs). These updates synchronize the atomic clocks on board the satellites to within one microsecond and adjust the ephemeris (table of positions of celestial bodies) of each satellite's internal orbital model. The updates are created by a Kalman Filter which uses inputs from the ground monitoring stations, space weather information, and other various inputs. 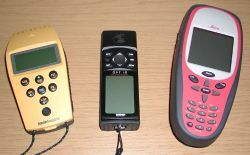 GPS receivers come in a variety of formats, from devices integrated into cars, phones, and watches, to dedicated devices such as those shown here from manufacturers Trimble, Garmin and Leica (left to right). The user's GPS receiver is the user segment (U.S.) of the GPS system. In general, GPS receivers are composed of an antenna, tuned to the frequencies transmitted by the satellites, receiver-processors, and a highly-stable clock (often a crystal oscillator). They may also include a display for providing location and speed information to the user. A receiver is often described by its number of channels: This signifies how many satellites it can monitor simultaneously. Originally limited to four or five, this has progressively increased over the years so that, as of 2006, receivers typically have between twelve and twenty channels. A typical OEM GPS receiver module, based on the SiRF Star III chipset, measuring 12 x 15mm, and used in many products. 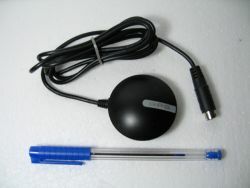 Many GPS receivers can relay position data to a PC or other device using the NMEA 0183 protocol. NMEA 2000 is a newer and less widely adopted protocol. Both are proprietary and controlled by the US-based National Marine Electronics Association. References to the NMEA protocols have been compiled from public records, allowing open source tools like gpsd to read the protocol without violating intellectual property laws. Other proprietary protocols exist as well, such as by SiRF Technology Inc. Receivers can interface with other devices using methods including a serial connection, USB or Bluetooth. GPS satellites broadcast three different types of data in the primary navigation signal. The first is the almanac which sends coarse time information along with status information about the satellites. The second is the ephemeris, which contains orbital information that allows the receiver to calculate the position of the satellite. This data is included in the 37,500 bit Navigation Message, which takes 12.5 minutes to send at 50 bps. L1 (1575.42 MHz): Mix of Navigation Message, coarse-acquisition (C/A) code and encrypted precision P(Y) code. L2 (1227.60 MHz): P(Y) code, plus the new L2C code on the Block IIR-M and newer satellites. L3 (1381.05 MHz): Used by the Defense Support Program to signal detection of missile launches, nuclear detonations, and other high-energy infrared events. L5 (1176.45 MHz): Proposed for use as a civilian safety-of-life (SoL) signal (see GPS modernization). This frequency falls into an internationally protected range for aeronautical navigation, promising little or no interference under all circumstances. The first Block IIF satellite that would provide this signal is set to be launched in 2008. The coordinates are calculated according to the World Geodetic System WGS84 coordinate system. To calculate its position, a receiver needs to know the precise time. The satellites are equipped with extremely accurate atomic clocks, and the receiver uses an internal crystal oscillator-based clock that is continually updated using the signals from the satellites. The receiver identifies each satellite's signal by its distinct C/A code pattern, then measures the time delay for each satellite. To do this, the receiver produces an identical C/A sequence using the same seed number as the satellite. By lining up the two sequences, the receiver can measure the delay and calculate the distance to the satellite, called the pseudorange. The orbital position data from the Navigation Message is then used to calculate the satellite's precise position. Knowing the position and the distance of a satellite indicates that the receiver is located somewhere on the surface of an imaginary sphere centered on that satellite and whose radius is the distance to it. 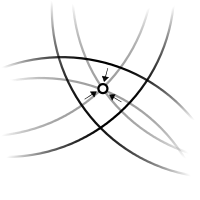 When four satellites are measured simultaneously, the intersection of the four imaginary spheres reveals the location of the receiver. Earth-based users can substitute the sphere of the planet for one satellite by using their altitude. Often, these spheres will overlap slightly instead of meeting at one point, so the receiver will yield a mathematically most-probable position (and often indicate the uncertainty). Calculating a position with the P(Y) signal is generally similar in concept, assuming one can decrypt it. The encryption is essentially a safety mechanism; if a signal can be successfully decrypted, it is reasonable to assume it is a real signal being sent by a GPS satellite. In comparison, civil receivers are highly vulnerable to spoofing since correctly formatted C/A signals can be generated using readily available signal generators. RAIM features will not help, since RAIM only checks the signals from a navigational perspective. The position calculated by a GPS receiver requires the current time, the position of the satellite and the measured delay of the received signal. The position accuracy is primarily dependent on the satellite position and signal delay. To measure the delay, the receiver compares the bit sequence received from the satellite with an internally generated version. By comparing the rising and trailing edges of the bit transitions, modern electronics can measure signal offset to within about 1 percent of a bit time, or approximately 10 nanoseconds for the C/A code. Since GPS signals propagate nearly at the speed of light, this represents an error of about 3 meters. This is the minimum error possible using the GPS C/A signal. Position accuracy can be improved by using the higher-speed P(Y) signal. Assuming the same 1 percent accuracy, the faster P(Y) signal results in an accuracy of about 30 centimeters. Electronics errors are one of several accuracy-degrading effects outlined in the table below. When taken together, autonomous civilian GPS horizontal position fixes are typically accurate to about 15 meters (50 ft). These effects also reduce the more precise P(Y) code's accuracy. Changing atmospheric conditions change the speed of the GPS signals as they pass through the Earth's atmosphere and ionosphere. Correcting these errors is a significant challenge to improving GPS position accuracy. These effects are minimized when the satellite is directly overhead, and become greater for satellites nearer the horizon, since the signal is affected for a longer time. Once the receiver's approximate location is known, a mathematical model can be used to estimate and compensate for these errors. Because ionospheric delay affects the speed of radio waves differently based on frequency, a characteristic known as dispersion (a phenomenon where a light signal is separated into its constituent elements), both frequency bands can be used to help reduce this error. Some military and expensive survey-grade civilian receivers compare the different delays in the L1 and L2 frequencies to measure atmospheric dispersion, and apply a more precise correction. This can be done in civilian receivers without decrypting the P(Y) signal carried on L2, by tracking the carrier wave instead of the modulated code. To facilitate this on lower cost receivers, a new civilian code signal on L2, called L2C, was added to the Block IIR-M satellites, first launched in 2005. It allows a direct comparison of the L1 and L2 signals using the coded signal instead of the carrier wave. The effects of the ionosphere are generally slow-moving, and can be averaged over time. The effects for any particular geographical area can be easily calculated by comparing the GPS-measured position to a known surveyed location. This correction is also valid for other receivers in the same general location. Several systems send this information over radio or other links to allow only L1 receivers to make ionospheric corrections. The ionospheric data are transmitted via satellite in Satellite Based Augmentation Systems such as Wide Area Augmentation System (WAAS), which transmits it on the GPS frequency using a special pseudo-random number (PRN), so only one antenna and receiver are required. Humidity also causes a variable delay, resulting in errors similar to ionospheric delay, but occurring in the troposphere. This effect is much more localized, and changes more quickly than the ionospheric effects, making precise compensation for humidity more difficult. Altitude also causes a variable delay, as the signal passes through less atmosphere at higher elevations. Since the GPS receiver measures altitude directly, this is a much simpler correction to apply. GPS signals can also be affected by multipath issues, where the radio signals reflect off surrounding terrain such as buildings, canyon walls, and hard ground. These delayed signals can cause inaccuracy. A variety of techniques, most notably narrow correlator spacing, have been developed to mitigate multipath errors. For long delay multipath, the receiver itself can recognize the wayward signal and discard it. To address shorter delay multipath from the signal reflecting off the ground, specialized antennas may be used. Short delay reflections are harder to filter out since they are only slightly delayed, causing effects almost indistinguishable from routine fluctuations in atmospheric delay. Multipath effects are much less severe in moving vehicles. When the GPS antenna is moving, the false solutions using reflected signals quickly fail to converge and only the direct signals result in stable solutions. The navigation message from a satellite is sent out only every 12.5 minutes. In reality, the data contained in these messages tend to be "out of date" by a greater distance. Consider the case when a GPS satellite is boosted back into a proper orbit; for some time following the maneuver, the receiver's calculation of the satellite's position will be incorrect until it receives another ephemeris update. The onboard clocks are extremely accurate, but they do suffer from some clock drift. This problem tends to be very small, but may add up to 2 meters (~6 ft) of inaccuracy. This class of error is more "stable" than ionospheric problems and tends to change over days or weeks rather than minutes. This makes correction fairly simple by sending out a more accurate almanac on a separate channel. The GPS includes a feature called Selective Availability (SA) that introduces intentional errors between 0 meters and up to a hundred meters (300 ft) into the publicly available navigation signals, making it difficult to use for guiding long range missiles to precise targets. Additional accuracy was available in the signal, but in an encrypted form that was only available to the United States military, its allies, and a few others, mostly government users. SA typically added signal errors of up to about 10 meters (30 ft) horizontally and 30 meters (100 ft) vertically. The inaccuracy of the civilian signal was deliberately encoded so as not to change very quickly, for instance the entire eastern U.S. area might read 30 m off, but 30 m off everywhere and in the same direction. In order to improve the usefulness of GPS for civilian navigation, Differential GPS was used by many civilian GPS receivers to greatly improve accuracy. During the Gulf War, the shortage of military GPS units and the wide availability of civilian ones among personnel resulted in a decision to disable Selective Availability. This was ironic, as SA had been introduced specifically for these situations, allowing friendly troops to use the signal for accurate navigation, while at the same time denying it to the enemy. But since SA was also denying the same accuracy to thousands of friendly troops, turning it off or setting it to an error of 0 meters (effectively the same thing) presented a clear benefit. In the 1990s, the FAA started pressuring the military to turn off SA permanently. This would save the FAA millions of dollars every year in maintenance of their own radio navigation systems. The military resisted for most of the 1990s, but SA was eventually "discontinued;" the amount of error added was "set to zero" at midnight on May 1, 2000 following an announcement by U.S. President Bill Clinton, allowing users access to an undergraded L1 signal. Per the directive, the induced error of SA was changed to add no error to the public signals (C/A code). Selective Availability is still a system capability of GPS, and error could, in theory, be reintroduced at any time. In practice, in view of the hazards and costs this would induce for U.S. and foreign shipping, it is unlikely to be reintroduced, and various government agencies, including the FAA, have stated that it is not intended to be reintroduced. The US military has developed the ability to locally deny GPS (and other navigation services) to hostile forces in a specific area of crisis without affecting the rest of the world or its own military systems. According to the theory of relativity, due to their constant movement and height relative to the Earth-centered inertial reference frame, the clocks on the satellites are affected by their speed (special relativity) as well as their gravitational potential (general relativity). For the GPS satellites, general relativity predicts that the atomic clocks at GPS orbital altitudes will tick more rapidly, by about 45,900 nanoseconds (ns) per day, because they are in a weaker gravitational field than atomic clocks on Earth's surface. Special relativity predicts that atomic clocks moving at GPS orbital speeds will tick more slowly, by about 7,200 ns per day, than stationary ground clocks. When combined, the discrepancy is 38 microseconds per day; a difference of 4.465 parts in 1010. To account for this, the frequency standard onboard each satellite is given a rate offset prior to launch, making it run slightly slower than the desired frequency on Earth; specifically, at 10.22999999543 MHz instead of 10.23 MHz. Another relativistic effect to be compensated for in GPS observation processing is the Sagnac effect. The GPS time scale is defined in an inertial system but observations are processed in an Earth-centered, Earth-fixed (co-rotating) system; a system in which simultaneity is not uniquely defined. The Lorentz transformation between the two systems modifies the signal run time, a correction having opposite algebraic signs for satellites in the Eastern and Western celestial hemispheres. Ignoring this effect will produce an East-West error on the order of hundreds of nanoseconds, or tens of meters in position. The atomic clocks on board the GPS satellites are precisely tuned, making the system a practical engineering application of the scientific theory of relativity in a real-world system. Since GPS signals at terrestrial receivers tend to be relatively weak, it is easy for other sources of electromagnetic radiation to overpower the receiver, making acquiring and tracking the satellite signals difficult or impossible. Solar flares are one such naturally occurring emission with the potential to degrade GPS reception, and their impact can affect reception over the half of the Earth facing the sun. GPS signals can also be interfered with by naturally occurring geomagnetic storms, predominantly found at near the poles of the Earth's magnetic field. Human-made interference can also disrupt, or jam, GPS signals. In one well-documented case, an entire harbor was unable to receive GPS signals due to unintentional jamming caused by a malfunctioning TV antenna preamplifier. Intentional jamming is also possible. Generally, stronger signals can interfere with GPS receivers when they are within radio range, or line of sight. In 2002, a detailed description of how to build a short range GPS L1 C/A jammer was published in the online magazine Phrack. The U.S. government believes that such jammers were used occasionally during the Afghanistan War and the U.S. military claimed to destroy a GPS jammer with a GPS-guided bomb during the Iraq War.. While a jammer is relatively easy to detect and locate, making it an attractive target for anti-radiation missiles, there is the possibility that these jammers would then be located near non-combatant infrastructure and used to attract the precision-guided munitions towards; a tactic known as using a human shield. Due to the potential for both natural and man-made noise, numerous techniques continue to be developed to deal with the interference. The first is to not rely on GPS as a sole source. According to John Ruley, "IFR pilots should have a fallback plan in case of a GPS malfunction." Receiver Autonomous Integrity Monitoring (RAIM) is a feature now included in some receivers, which is designed to provide a warning to the user if jamming or another problem is detected. The military has also deployed the Selective Availability / Anti-Spoofing Module (SAASM) in its Defense Advanced GPS Receiver, which as shown in demonstration videos, is able to detect the jamming and maintain a lock on the GPS signals. Augmentation methods of improving accuracy rely on external information being integrated into the calculation process. There are many such systems in place and they are generally named or described based on how the GPS sensor receives the information. Some systems transmit additional information about sources of error (such as clock drift, ephemeris, or ionospheric delay), others provide direct measurements of how much the signal was off in the past, while a third group provide additional navigational or vehicle information to be integrated in the calculation process. Examples of augmentation systems include the WAAS, Differential GPS, and Inertial Navigation Systems. The accuracy of a calculation can also be improved through precise monitoring and measuring of the existing GPS signals in additional or alternate ways. The first is called Dual Frequency monitoring, and refers to systems that can compare two or more signals, such as the L1 frequency to the L2 frequency. Since these are two different frequencies, they are affected in different, yet predictable ways by the atmosphere and objects around the receiver. After monitoring these signals, it is possible to calculate how much error is being introduced and then nullify that error. Receivers that have the correct decryption key can relatively easily decode the P(Y)-code transmitted on both L1 and L2 to measure the error. Receivers that do not possess the key can still use a process called codeless to compare the encrypted information on L1 and L2 to gain much of the same error information. However, this technique is currently limited to specialized surveying equipment. In the future, additional civilian codes are expected to be transmitted on the L2 and L5 frequencies. When these become operational, non-encrypted users will be able to make the same comparison and directly measure some errors. A second form of precise monitoring is called Carrier-Phase Enhancement (CPGPS). The error, which this corrects, arises because the pulse transition of the PRN is not instantaneous, and thus the correlation (satellite-receiver sequence matching) operation is imperfect. The CPGPS approach utilizes the L1 carrier wave, which has a period 1000 times smaller than that of the C/A bit period, to act as an additional clock signal and resolve the uncertainty. The phase difference error in the normal GPS amounts to between 2 and 3 meters (6 to 10 feet) of ambiguity. CPGPS working to within 1 percent of perfect transition reduces this error to 3 cm (1 inch) of ambiguity. By eliminating this source of error, CPGPS coupled with DGPS normally realizes between 20 and 30 cm (8 to 12 in) of absolute accuracy. Relative Kinematic Positioning (RKP) is another approach for a precise GPS-based positioning system. In this approach, determination of range signal can be resolved to an accuracy of less than 10 cm (4 in). This is done by resolving the number of cycles in which the signal is transmitted and received by the receiver. This can be accomplished by using a combination of differential GPS (DGPS) correction data, transmitting GPS signal phase information and ambiguity resolution techniques via statistical tests—possibly with processing in real-time (real-time kinematic positioning, RTK). While most clocks are synchronized to Coordinated Universal Time (UTC), the Atomic clocks on the satellites are set to GPS time. The difference is that GPS time is not corrected to match the rotation of the Earth, so it does not contain leap seconds or other corrections which are periodically added to UTC. GPS time was set to match Coordinated Universal Time (UTC) in 1980, but has since diverged. The lack of corrections means that GPS time remains synchronized with the International Atomic Time (TAI). The GPS navigation message includes the difference between GPS time and UTC, which as of 2006 is 14 seconds. Receivers subtract this offset from GPS time to calculate UTC and 'local' time. New GPS units may not show the correct UTC time until after receiving the UTC offset message. The GPS-UTC offset field can accommodate 255 leap seconds (eight bits) which, at the current rate of change of the Earth's rotation, is sufficient to last until the year 2330. As opposed to the year, month, and day format of the Julian calendar, the GPS date is expressed as a week number and a day-of-week number. The week number is transmitted as a ten-bit field in the C/A and P(Y) navigation messages, and so it becomes zero again every 1,024 weeks (19.6 years). GPS week zero started at 00:00:00 UTC (00:00:19 TAI) on January 6 1980 and the week number became zero again for the first time at 23:59:47 UTC on August 21 1999 (00:00:19 TAI on August 22, 1999). In order to determine the current Gregorian date, a GPS receiver must be provided with the approximate date (to within 3,584 days) in order to correctly translate the GPS date signal. To address this concern the modernized GPS navigation messages use a 13-bit field, which repeats every 8,192 weeks (157 years), and will not return to zero until near the year 2137. Having reached the program's requirements for Full Operational Capability (FOC) on July 17, 1995, the GPS completed its original design goals. However, additional advances in technology and new demands on the existing system led to the effort to "modernize" the GPS system. Announcements from the Vice Presidential and the White House in 1998 heralded the beginning of these changes, and in 2000 the U.S. Congress reaffirmed the effort; referred to it as GPS III. The project aims to improve the accuracy and availability for all users and involves new ground stations, new satellites, and four additional navigation signals. New civilian signals are called L2C, L5, and L1C; the new military code is called M-Code. Initial Operational Capability (IOC) of the L2C code is expected in 2008. GPS allows accurate targeting of various military weapons including cruise missiles and precision-guided munitions. To help prevent GPS guidance from being used in enemy or improvised weaponry, the US Government controls the export of civilian receivers. A US-based manufacturer cannot generally export a receiver unless the receiver contains limits restricting it from functioning when it is simultaneously (1) at an altitude above 18 kilometers (60,000ft) and (2) traveling at over 515 m/s (1,000 knots). The GPS satellites also carry nuclear detonation detectors, which form a major portion of the United States Nuclear Detonation Detection System. Automobiles can be equipped with GPS receivers at the factory or as after-market equipment. Units often display moving maps and information about location, speed, direction, and nearby streets and landmarks. Aircraft navigation systems usually display a "moving map" and are often connected to the autopilot for en-route navigation. Cockpit-mounted GPS receivers and glass cockpits are appearing in general aviation aircraft of all sizes, using technologies such as WAAS or Local Area Augmentation System (LAAS) to increase accuracy. Many of these systems may be certified for instrument flight rules navigation, and some can also be used for final approach and landing operations. Glider pilots use GNSS Flight Recorders to log GPS data verifying their arrival at turn points in gliding competitions. Flight computers installed in many gliders also use GPS to compute wind speed aloft, and glide paths to waypoints such as alternate airports or mountain passes, to aid en route decision making for cross-country soaring. Boats and ships can use GPS to navigate all of the world's lakes, seas, and oceans. Maritime GPS units include functions useful on water, such as “man overboard” (MOB) functions that allow instantly marking the location where a person has fallen overboard, which simplifies rescue efforts. GPS may be connected to the ships self-steering gear and Chartplotters using the NMEA 0183 interface. GPS can also improve the security of shipping traffic by enabling AIS. Heavy Equipment can use GPS in construction, mining and precision agriculture. The blades and buckets of construction equipment are controlled automatically in GPS-based machine guidance systems. Agricultural equipment may use GPS to steer automatically, or as a visual aid displayed on a screen for the driver. This is very useful for controlled traffic and row crop operations and when spraying. Harvesters with yield monitors can also use GPS to create a yield map of the paddock being harvested. Bicycles often use GPS in racing and touring. GPS navigation allows cyclists to plot their course in advance and follow this course, which may include quieter, narrower streets, without having to stop frequently to refer to separate maps. Some GPS receivers are specifically adapted for cycling with special mounts and housings. Hikers, climbers, and even ordinary pedestrians in urban or rural environments can use GPS to determine their position, with or without reference to separate maps. In isolated areas, the ability of GPS to provide a precise position can greatly enhance the chances of rescue when climbers or hikers are disabled or lost (if they have a means of communication with rescue workers). 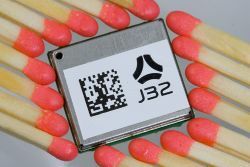 A modern SiRF Star III chip based 20-channel GPS receiver with WAAS/EGNOS support. Spacecraft are now beginning to use GPS as a navigational tool. The addition of a GPS receiver to a spacecraft allows precise orbit determination without ground tracking. This, in turn, enables autonomous spacecraft navigation, formation flying, and autonomous rendezvous. The use of GPS in MEO, GEO, HEO, and highly elliptical orbits is feasible only if the receiver can acquire and track the much weaker (15 - 20 dB) GPS side-lobe signals. This design constraint, and the radiation environment found in space, prevents the use of COTS receivers. Surveying—Survey-Grade GPS receivers can be used to position survey markers, buildings, and road construction. These units use the signal from both the L1 and L2 GPS frequencies. Even though the L2 code data are encrypted, the signal's carrier wave enables correction of some ionospheric errors. These dual-frequency GPS receivers typically cost US$10,000 or more, but can have positioning errors on the order of one centimeter or less when used in carrier phase differential GPS mode. Mapping and geographic information systems (GIS)—Most mapping grade GPS receivers use the carrier wave data from only the L1 frequency, but have a precise crystal oscillator which reduces errors related to receiver clock jitter. This allows positioning errors on the order of one meter or less in real-time, with a differential GPS signal received using a separate radio receiver. By storing the carrier phase measurements and differentially post-processing the data, positioning errors on the order of 10 cm are possible with these receivers. Geophysics and geology—High precision measurements of crustal strain can be made with differential GPS by finding the relative displacement between GPS sensors. Multiple stations situated around an actively deforming area (such as a volcano or fault zone) can be used to find strain and ground movement. These measurements can then be used to interpret the cause of the deformation, such as a dike or sill beneath the surface of an active volcano. This antenna is mounted on the roof of a hut containing a scientific experiment needing precise timing. Precise time reference—Many systems that must be accurately synchronized use GPS as a source of accurate time. GPS can be used as a reference clock for time code generators or NTP clocks. Sensors (for seismology or other monitoring application), can use GPS as a precise time source, so events may be timed accurately. TDMA communications networks often rely on this precise timing to synchronize RF generating equipment, network equipment, and multiplexers. Mobile Satellite Communications—Satellite communications systems use a directional antenna (usually a "dish") pointed at a satellite. The antenna on a moving ship or train, for example, must be pointed based on its current location. Modern antenna controllers usually incorporate a GPS receiver to provide this information. Emergency and Location-based services—GPS functionality can be used by emergency services to locate cell phones. The ability to locate a mobile phone is required in the United States by E911 emergency services legislation. However, as of September 2006 such a system is not in place in all parts of the country. GPS is less dependent on the telecommunications network topology than radiolocation for compatible phones. Assisted GPS reduces the power requirements of the mobile phone and increases the accuracy of the location. A phone's geographic location may also be used to provide location-based services including advertising, or other location-specific information. Location-based games—The availability of hand-held GPS receivers has led to games such as Geocaching, which involves using a hand-held GPS unit to travel to a specific longitude and latitude to search for objects hidden by other geocachers. This popular activity often includes walking or hiking to natural locations. Geodashing is an outdoor sport using waypoints. Aircraft passengers—Most airlines allow passenger use of GPS units on their flights, except during landing and take-off when other electronic devices are also restricted. Even though consumer GPS receivers have a minimal risk of interference, a few airlines disallow use of hand-held receivers during flight. Other airlines integrate aircraft tracking into the seat-back television entertainment system, available to all passengers even during takeoff and landing. Heading information—The GPS system can be used to determine heading information, even though it was not designed for this purpose. 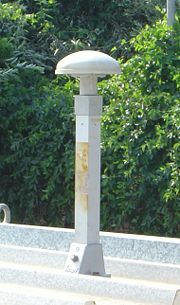 A "GPS compass" uses a pair of antennas separated by about 50 cm to detect the phase difference in the carrier signal from a particular GPS satellite. 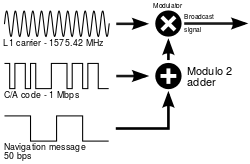 Given the positions of the satellite, the position of the antenna, and the phase difference, the orientation of the two antennas can be computed. More expensive GPS compass systems use three antennas in a triangle to get three separate readings with respect to each satellite. A GPS compass is not subject to magnetic declination as a magnetic compass is, and doesn't need to be reset periodically like a gyrocompass. It is, however, subject to multipath effects. GPS tracking systems use GPS to determine the location of a vehicle, person, or pet and to record the position at regular intervals in order to create a log of movements. The data can be stored inside the unit, or sent to a remote computer by radio or cellular modem. Some systems allow the location to be viewed in real-time on the Internet with a web-browser. Weather Prediction Improvements—Measurement of atmospheric bending of GPS satellite signals by specialized GPS receivers in orbital satellites can be used to determine atmospheric conditions such as air density, temperature, moisture and electron density. Such information from a set of six micro-satellites, launched in April 2006, called the Constellation of Observing System for Meteorology, Ionosphere and Climate COSMIC has been proven to improve the accuracy of weather prediction models. Photograph annotation—Combining GPS position data with photographs taken with a (typically digital) camera, allows one to lookup the locations where the photographs were taken in a gazeteer, and automatically annotate the photographs with the name of the location they depict. The GPS device can be integrated into the camera, or the timestamp of a picture's metadata can be combined with a GPS track log. Skydiving—Most commercial drop zones use a GPS to aid the pilot to "spot" the plane to the correct position relative to the dropzone that will allow all skydivers on the load to be able to fly their canopies back to the landing area. The "spot" takes into account the number of groups exiting the plane and the upper winds. In areas where skydiving through cloud is permitted the GPS can be the sole visual indicator when spotting in overcast conditions, this is referred to as a "GPS Spot." Marketing—Some market research companies have combined GIS systems and survey based research to help companies to decide where to open new branches, and to target their advertising according to the usage patterns of roads and the socio-demographic attributes of residential zones. In 1983, after Soviet interceptor aircraft shot down the civilian airliner KAL 007 in restricted Soviet airspace, killing all 269 people on board, U.S. President Ronald Reagan announced that the GPS system would be made available for civilian uses once it was completed. On May 2, 2000 "Selective Availability" was discontinued, allowing users outside the US military to receive a full quality signal. The most recent launch was on November 17, 2006. The oldest GPS satellite still in operation was launched in August 1991. Bradford Parkinson, professor of aeronautics and astronautics at Stanford University, conceived the present satellite-based system in the early 1960s and developed it in conjunction with the U.S. Air Force. One GPS developer, Roger L. Easton, received the National Medal of Technology on February 13 2006 at the White House. GLONASS (GLObal NAvigation Satellite System) is operated by Russia, although with only twelve active satellites as of 2004. In Russia, Northern Europe and Canada, at least four GLONASS satellites are visible 45 percent of time. There are plans to restore GLONASS to full operation by 2008 with assistance from India. Galileo is being developed by the European Union, joined by China, Israel, India, Morocco, Saudi Arabia and South Korea, Ukraine planned to be operational by 2010. Beidou may be developed independently by China. ↑ HowStuffWorks, How GPS Receivers Work. Retrieved May 14, 2006. ↑ Global Security, GPS. Retrieved June 20, 2007. ↑ Peter H. Dana, GPS Orbital Planes. Retrieved February 18, 2009. ↑ Metaresearch, What the Global Positioning System Tells Us about Relativity. Retrieved January 2, 2007. ↑ USCG Navcen, GPS Frequently Asked Questions. Retrieved January 3, 2007. ↑ Paul Massatt and Wayne Brady, Optimizing performance through constellation management, Crosslink. Retrieved June 20, 2007. ↑ US Coast Guard, General GPS News 9-9-05. Retrieved June 20, 2007. ↑ Britannica Concise Encyclopedia, Ephemeris. Retrieved June 20, 2007. ↑ USNO, NAVSTAR Global Positioning System. Retrieved May 14, 2006. ↑ Global Positioning System, Ephemeris and Clock Errors. Retrieved June 13, 2007. ↑ 11.0 11.1 Office of Science and Technology Policy, Presidential statement to stop degrading GPS. Retrieved May 1, 2000. ↑ GPS, Selective Availability. Retrieved June 13, 2007. ↑ Chris Rizos, GPS Satellite Signals, Univ. of New South Wales. ↑ ATI Courses, The Global Positioning System by Robert A. Nelson Via Satellite. Retrieved February 18, 2009. ↑ Neil Ashby, Relativity and GPS, Physics Today. Retrieved February 18, 2009. ↑ Space Environment Center, SEC Navigation Systems GPS Page. Retrieved February 18, 2009. ↑ GPS World, The hunt for an unintentional GPS jammer. Retrieved January 1, 2003. ↑ Phrack, Low Cost and Portable GPS Jammer. Retrieved June 20, 2007. ↑ American Forces Press Service, CENTCOM charts progress. Retrieved March 25, 2003. ↑ John Ruley, GPS jamming. Retrieved February 12, 2003. ↑ GPS Receivers, Facts for the Warfighter. Retrieved April 10, 2007. ↑ GPS, GPS Interference and Jamming. Retrieved June 13, 2007. ↑ GSP, Precise Monitoring. Retrieved June 13, 2007. ↑ GPS, GPS Time and Date. Retrieved June 13, 2007..
↑ U.S. Coast Guard, Global Positioning System Fully Operational. Retrieved June 20, 2007. ↑ GPS, GPS Modernization. Retrieved June 13, 2007. ↑ Arms Control Association, Missile Technology Control Regime. Retrieved May 17, 2006. ↑ Sandia National Laboratory, Nonproliferation programs and arms control technology. Retrieved June 20, 2007. ↑ Joe Mehaffey, Is it Safe to use a handheld GPS Receiver on a Commercial Aircraft? Retrieved February 18, 2009. ↑ JRC America, JLR-10 GPS Compass. Retrieved Jan. 6, 2007. ↑ Diomidis Spinellis, Position-annotated photographs: A geotemporal web. Retrieved February 18, 2009. ↑ K. Iwasaki, K. Yamazawa, and N. Yokoya, An indexing system for photos based on shooting position and orientation with geographic database. Retrieved June 20, 2007. ↑ Hydrographic Society Journal, Developments in Global Navigation Satellite Systems. Retrieved April 5, 2007. ↑ United States Department of Defense, Announcement of Initial Operational Capability. Retrieved February 18, 2009. ↑ National Archives and Records Administration, U.S. GLOBAL POSITIONING SYSTEM POLICY. Retrieved February 18, 2009. ↑ United States Naval Research Laboratory, National Medal of Technology for GPS. Retrieved February 18, 2009. ↑ The Inquirer, Chinese threaten to dump Galileo GPS. Retrieved June 20, 2007. Brain, Marshall, and Tom Harris. How GPS Receivers Work. HowStuffWorks.com. Retrieved May 14, 2006. Dana, Peter H. "Global Positioning System Overview." The Geographer's Craft Project. Department of Geography, The University of Colorado at Boulder, 1999. Retrieved May 28, 2007. Nelson, Robert A. The Global Positioning System. Applied Technology Institute, 1999. Retrieved May 28, 2007. GPS.gov—General public education website created by the U.S. Government. U.S. Naval Observatory's GPS constellation status. HowStuffWorks' Simplified explanation of GPS. Dana, Peter H. "Global Positioning System Overview". Satellite Navigation: GPS & Galileo (PDF)—16-page paper about the history and working of GPS, touching on the upcoming Galileo. Navstar, including information about each satellite's configuration and launch. History of "Global Positioning System"
This page was last modified on 23 June 2017, at 16:19.